An association between artistic creativity and mental illness is something many of us take for granted without questioning which came first or why the two should be linked. In her new graphic memoir, cartoonist Ellen Forney tackles that question in light of its impact on her work as an artist with Bipolar I Disorder. Her personal story is both funny and touching, but the research Forney did while trying to understand her own condition gives Marbles usefulness beyond the human sharing common to memoir. The book opens with Forney getting a tattoo on her back, so charged from the endorphin rush that she kisses the artist (“Tongue & all!”) afterwards and walks home in the snow. “Everything was magical & intense, & bursting with universal truth.” Soon after, her therapist refers Forney to a psychiatrist, and the two begin to look at her extreme moods and try to find a course of treatment. Forney is resistant; after all, if she’s now officially a “crazy artist,” won’t treatment reduce her creativity? Her manic high leads her to think she can plan ahead for the next down cycle, but when it comes it’s all-consuming. Forney’s drawings capture the wide turns her moods take perfectly. Long-known for her comic strip I Was Seven in ’75, her artwork found a larger audience when she collaborated with Sherman Alexie on The Absolutely True Diary of a Part-Time Indian. Her bold lines can convey a zaggy energy or deep stillness, then taper into fine detail. Talking to her therapist while still manic, a second head shoots out of her own head and conks itself on the ‘ceiling’ of the panel, overflowing with empty speech balloons. When she crashes, there’s a single page that shows a body rising from a bed, walking into another room still wrapped in a blanket, sitting on a couch, then lying back down in fourteen small drawings. The lines are clean against a stark white page, and the sense of nothingness is beautiful and frightening in equal measure. 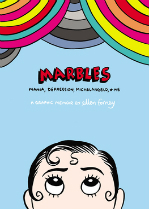 Because Marbles was created after Forney elected to stay the balanced course and continue treatment (Forney eventually found a drug cocktail that worked), it’s heartening to report that the book is a creative triumph. An illness memoir, yes, but a family story as well, of both biological heredity and the artistic legacy of the members of “Club Van Gogh,” who Forney comes to see as “company” on her own journey. Anyone dealing with bipolar disorder firsthand or with friends or family will find great company in Marbles. It’s a gripping story, and beautifully rendered.